UT College Democrats hosted the mayor of Tallahassee and democratic candidate for Florida Governor Andrew Gillum, on Oct. 4 in Jenkins. Gillum touched on a variety of issues the state of Florida is facing, but immediately drew attention to two topics: the devastation caused by hurricane Maria in Puerto Rico and its slow recovery, and the mass shooting in Las Vegas on Oct. 1. Gillum said that the public has been able to have a more up close and personal view of the occurrences in the island with Trump’s visit on Oct. 3, but that the situation remains dire and he urged his audience to do everything they could to help with the island’s recovery. Casey Baeur, UT College Democrats president, said having Mayor Gillum come and speak was part of an effort to increase student engagement in politics. A student asked Gillum what he would do as Governor knowing that there would be an exodus of Puerto Rican evacuees to Florida. He responded that he would ensure the seamless integration of these civilians into the Florida community and make sure that they receive all the help they need. “Every benefit that you get as a Floridian ought to be made available to those fellow American citizens who are coming into our state,” Gillum said. With regard to the Las Vegas shooting, he advocated for gun control, saying that weapons capable of wiping out multiple lives in a matter of minutes are weapons of war that should not to be accessible to civilians. If Gillum becomes the 2018 Governor of Florida, he plans to tackle things like poverty level wages, sea level rises, investment in solar and renewable energy, new infrastructure for transportation and expanding Medicaid. As Gillum finished laying out his vision for the future of Florida, he opened the floor for questions. Mani Thangadurai, second year MS Finance, asked Gillum what he proposes to do to alleviate the tension that exists within the African-American community as, if elected, he would be the first non white governor of Florida. In response, Gillum talked about The Longest Table, an effort he organized for the citizens of Tallahassee to come together to talk about the issues in their city and break down the barriers that exist in their community. Gillum said that through cooperation real change can happen. “If we can start to have some deliberate conversations and put people together and try to encourage curiosity over judgement, it would be interesting to see what happens,” Gillum said. Rozlyn Calderon, a junior political science major, said that seeing Mayor Gillum speak was exciting. 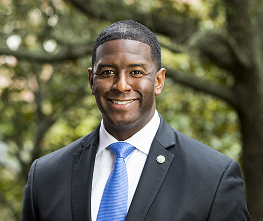 Gillum is a Miami native and was the first person in his family to graduate college. He then went on to become the youngest person ever elected to the Tallahassee City Commission at the age of 23 in February 2003. Gillum, currently 38, made it a point to share this fact with his audience to prove that it is never too early to start getting involved in your community. The turnout was minimal which made the Mayor exhort the students to engage in conversation. College Democrats hope to host all the democratic candidates running for Governor 2018 of Florida.